EVERY time I think I have seen the very best of Scotland something else comes along to raise the bar even higher. 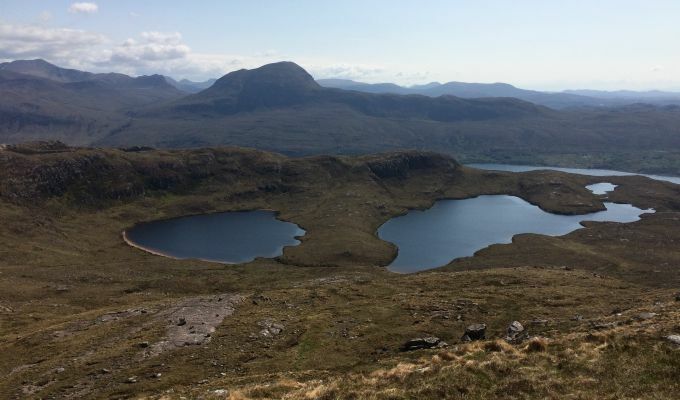 It happened again when I visited Beinn Ghobhlach, a little gem of a hill located on the spit of land between Loch Broom and Little Loch Broom in the north-west Highlands. At just over 2000 feet, it’s at the lower end of the Grahams category, but it is remote, rugged, and the views from the summit are revelatory. You won’t find crowds here but it certainly deserves more attention. Even the eight and a half mile drive to the start of the walk at Badrallach is stunning. I knew this was somewhere special as soon as I turned off the A832 just south of Dundonnell. The minor road twisted and turned over old stone humpback bridges and gently bubbling streams, past scattered buildings and stands of trees. At one point it appeared too narrow even for cars as it squeezed between columns of huge birch trees, ancient guardians providing a regimental welcome amid blue, lilac and white flowers on a carpet of gently waving emerald. And everywhere there was the brilliant yellow of gorse in full bloom, its colour turned up to the highest setting by the power of an unhindered sun and the vast ocean of a perfect blue sky. A few miles in and the landscape opens out, the road climbing to a high point and a switchback bend which then drops you down the other side to finish beside the handful of buildings at Badrallach. Dotted along the way was a series of signs warning sheep rustlers they were being watched by CCTV cameras. If there were any, cameras that is, they were well hidden. It seemed an unlikely spot for criminal enterprise. There was also a sign asking you to watch out for red squirrels crossing but I never saw them either. It’s not the end of civilisation though. From the end of the road a path cuts high above the shoreline, leading in some five miles to Scoraig, a small community which prefers not to have a road in despite offers from the local authority, and which lives by its own power supplies. There’s even a small school. 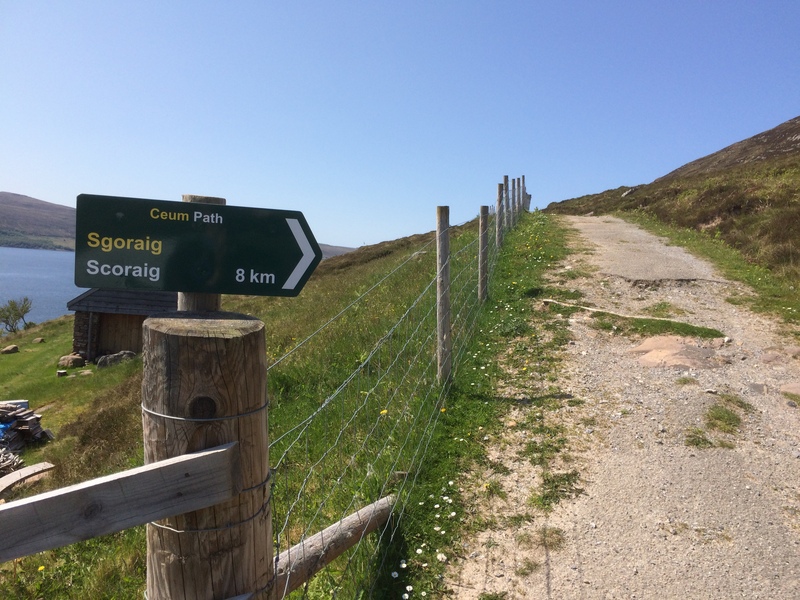 Travel in and out is by foot or bike along the path, or by ferry from the small jetty which allows crossings from the top end of Little Loch Broom. Whatever way you go, it’s a long way for your shopping. The path lends itself to tranquil walking with its perpetual view along the length of the loch but I had higher ambitions so somewhat reluctantly I cut off after about 15 minutes, heading up an open, grassy gully. There was no defined path but there were sings that either human or animal had come this way before and I soon reached a levelling in the terrain where two lochans sit. Beinn Ghobhlach rose dead ahead, its final slopes reached by the natural causeway between these two bodies of water. The ascent is steep but shortlived and suddenly you have a 360 degree vision that will envigorate no matter which way you look; the ferries passing the soaring Coigach cliffs on their way to Ullapool, the smattering of islands laid out on an endless blue pond, An Teallach and the Fisherfield mountains outrageous blue shapes jostling for prominence. 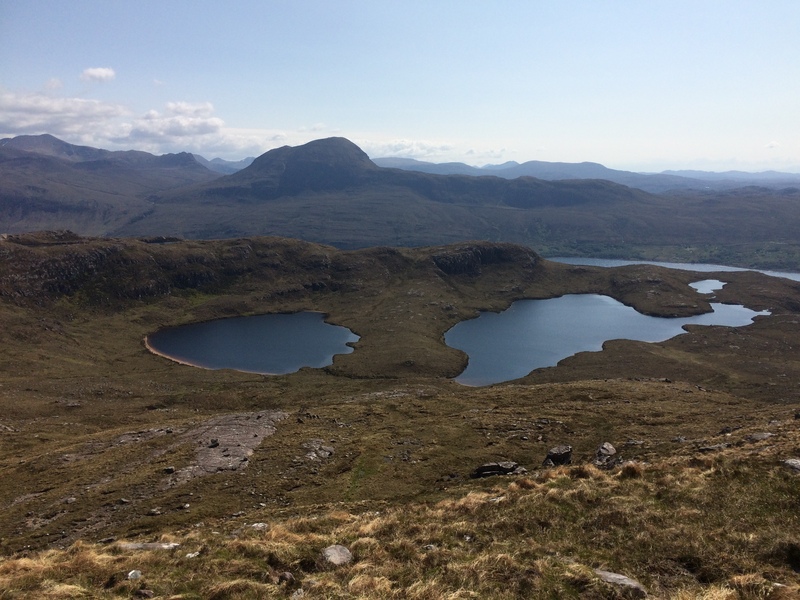 Directly south from the summit, the sparkling lochans reminded me of a pair of eyes, keeping watch over this timeless landscape. I met one other soul during this walk, his surprise equal to my own at our meeting. He had spent the last hour enjoying a mountain summit to himself and admitted it was hard making the decision to finally wrench himself away and back to reality. You can afford to linger awhile - the descent only took around an hour - and it is tempting to wait for the sunset washing over the horizon. It’s a place that deserves a grand finale.